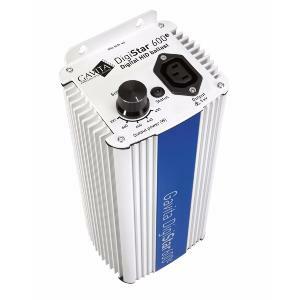 Gavita DigiStar adjustable electronic ballasts guarantee maximum lamp output regardless of a fluctuating input voltage. They operate completely silent, cool, safe and are more efficient than magnetic ballasts. The DigiStar ballasts have an adjustable output power. This feature allows you to dim and boost a lamp or to use different lamp powers with the same ballast, for example a 400W lamp for vegetative growth and 600W lamp for the flowering phase. Choose a suitable lamp for your high frequency electronic ballast to prevent lamp failure. This ballast is equipped with Soft Dim: When you adjust the output power with the selection switch the Soft Dim feature gradually adjusts the power in 60 seconds per output power step to protect the lamp. The new DigiStar e-series ballasts are suitable for the Gavita Master controller range of light controllers. Gavita controllers allow you to centrally switch, dim and boost you ballasts. They contain auto-dim features for high temperatures and emergency shutdown, as well as adjustable sunrise and sunset periods. Gavita controllers replace the traditional timer/ contactor and eliminate ballast inrush current. Each box also contains a 1.2m/4' RJ14/RJ14 interconnect cable.